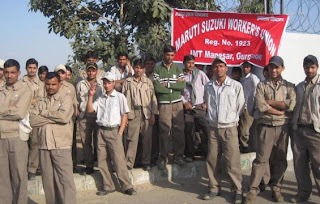 We are workers of Maruti Suzuki, who are behind bars since 18.07.2012 as part of a conspiracy, and without any just investigation. 147 of us are inside Gurgaon Central Jail. Since July, 2500 permanent and contract workers have been terminated from our jobs. In these past more than 8 months, we have sent our appeal to almost all administrative officials and elected representatives, including Chief Minister Haryana and the Prime Minister of India. But neither have our appeals been heard nor have we been granted bail. 1. One of our fellow workers, Sumit s/o Late Shri Chattar Singh, has no one in the family except his wife. Even then, when she gave delivery on 6.12.2012 in a hospital in Gurgaon, the bail plea or parole custody plea of Sumit was rejected. 2. One of our fellow workers, Vijendra s/o Dalel Singh was the lone earning member in his family. His mother stays sick at most times and was not able to accompany or help her daughter-in-law when she gave her delivery on 10.01.2013 in a hospital in Jhajjhar. Even then, Vijendra was neither granted bail nor let off on parole. 3. In the case of one of our fellow workers, Ramvilas s/o Late Shri Silak Ram, his grandmother, who fell sick after Ramvilas was put behind the bars as he was too affectionate to her, passed away on 26.02.2013. Ramvilas was not even let off on parole to meet his grandmother on her death-bed or to attend the funeral. After few days when it was the time of his wife’s delivery, his request for bail or parole custody was turned down. It caused a mental shock to him. 4. One of our fellow workers, Prempal, s/o Shri Chhiddilal, had the responsibility to look after his family alone, as his family’s livelihood depended entirely depended on his earnings. When he was thrown into jail arbitrarily, his two years old daughter mourning her father’s absence, fell sick and breathed her last. This wound was yet to heal, when Prempal’s mother aggrieved by the imprisonment of her son and the death of her granddaughter fell sick and passed away. But even after this, Prempal’s meager one-week parole leave permission was rejected and he was allowed only a one-hour parole visit on the next day of his grandmother’s funeral. His wife, now alone in the house and mourning the death of her daughter and Prempal’s mother, fell sick and had to be hospitalized. She is still unwell and there is no one to look after her. It has caused terrible mental agony for Prempal. 5. One of our fellow workers, Rahul, s/o Shri Vinod Ratan, was the only son of his parents, along with a sister. His sister got married on 16.11.2012. But he was not even granted parole custody to attend the ceremony for kanyadan. The marriage of the sole daughter took place in an environment of sadness, and Rahul is yet to recover from this wound. 6. One of our fellow workers, Subhash, s/o Shri Lal Chand, was very close to his grandmother. After his imprisonment, his grandmother almost stopped taking food and all the time used to think of his grandson, and passed away in grief some days later. But Subhash was not allowed even to attend her funeral on parole custody. These and many other incidents that go on daily in our lives are enough to fill up the pages of an entire book. About ourselves: our identity, family and work We all are children of workers and peasants. Our parents, with huge effort and sacrifice, ensured our 10th standard, 12th standard or ITI education, helped us stand on our feet to do something worthy in our life and help our family in need. We all joined Maruti Suzuki company after passing the written and viva-voce tests conducted by the company and on the terms and conditions set by the company. Before our joining, the company carried out all kinds of investigations, like police verification of our residential proof or whether we had criminal records! Neither of us had any previous criminal record. When we joined the company, the Manesar plant of the company was under construction. At that stage we foreseeing our future with the progress of the plant invested huge energy and diligence to lift the Manesar plant of the company to a new height. When the entire world was struggling under the economic crisis, we worked extra two hours daily to materialize a production of 10.5 lakh cars in a year. We were the sole creators of the increasing profit of the company, and today we are implicated as criminals and murderers, and those who engage in ‘mindless arson’! Almost all of us are from poor worker or peasant families which has been dependent on our job. We were struggling to weave dreams for our and our family’s future, such as of our own homes, of the better education for our brothers-sisters and children so that they could have a bright future and ensure a comfortable life for their parents who took the pain to bring after them. But in return, we were being exploited inside the company in all possible ways, such as: 1. At work, if any worker was unwell, he was not allowed to go to the dispensary and was forced to continue with the work in that condition. 2. We were not allowed to go to the toilet, the permission was there only at tea or lunch time. 3. Management used to behave with the workers very rudely with abusive language, and used to even slap or make them murga in order to punish them. 4. If a worker was forced to take 3-4 days leave because of his ill health or some accident or other serious problem in his family or because of the death of a relative, then half of his salary which amounted to almost Rs. 9000 used to be deducted by the company. Because of this continuous exploitation, the workers felt the need of forming a Union. 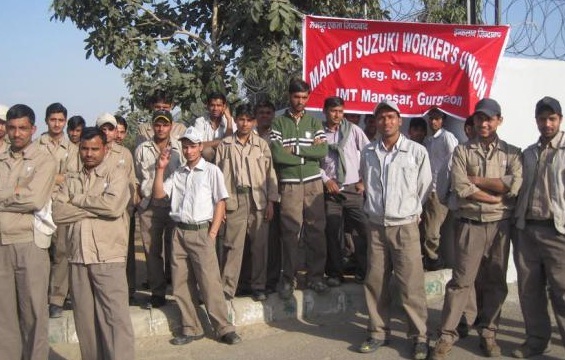 Maruti Suzuki company was against the idea of a union, and because of that, three strikes of the workers took place in 2011. After the third strike, thirty fellow workers of ours were forced to resign as they had participated in the strikes. But at last in February 2012 we were successful in registering our Union, in which the then HR Manager, Late Shri Awanish Kumar Dev, helped us. The company was angry with Mr. Dev because of his helpful attitude towards us and as a result, Mr. Dev resigned from the company. But the company did not accept the resignation of him as they were afraid that their misdeeds could get exposed. To crush the union and to remove Mr. Dev from its way, the company with a previously chalked out plan called the bouncers and hooligans in the factory premises on 18th July 2012 and materialized the ‘accident’. The present situation of the workers inside the Jail We, 147 workers in total, were thrown behind the bars without any just enquiry, and we are now here for more than 8 months. We are under severe psychological stress inside the jail. Many of us are suffering from diseases like tuberculosis, piles, mental imbalance and several other diseases. Almost all of us were earning members in our family and we are in jail now. Due to this our families are approaching the situation of dying of hunger. The education of the female members of the family and the children have stopped, which are otherwise their fundamental rights. The future of ours and our families has plunged into darkness. All the members of our families are mentally too disturbed. We are afraid lest they not take any wrong step because of the mental pressure. The present situation of the terminated workers outside the jail Apart from putting 147 workers behind the bars, the company terminated the service of almost 2500 regular and contract workers without any domestic enquiry and these workers are unemployed now. The condition of their families is also very serious. The situation is that they don’t have any proof of work experience, their career is doomed and whoever of them comes forward in our support, he is arrested and jailed immediately (the arrest of Imaan Khan, who was a member of Provisional Working Committee of MSWU and whose name was not there in the FIR, Charge-sheet or SIT report; also the names of 65 workers are under non-bailable arrest warrants). None of the jailed workers or the terminated workers outside have any occupation to sustain the livelihood of people dependent on them and it is putting everyone under mental pressure. Still, against all these odds, the struggle for justice of our fellow workers outside is giving us hope and energy behind the bars. In this struggle that has gone outside the factory in society now for more than 8 months, news of the solidarity that we have received from various parts of the country from workers, toilers and common people has continued to give us hope, and enthused our spirits.